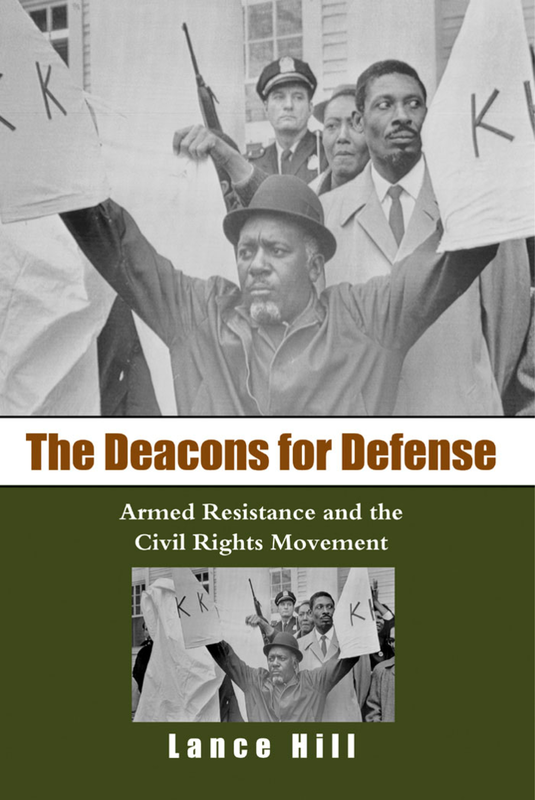 A pamphlet about the Deacons for Defense, an armed self-defense African-American civil rights organization in the U.S. Southern states during the 1960s. Paul Farmer has brought his pistol. The president of the Washington Parish White Citizens Council was standing in the middle of the street along with several other members of the council and the Ku Klux Klan. It was the autumn of 1966 in the small paper mill town of Bogalusa, Louisiana. The young black students heeded Burris’s advice. Fights between black and white students erupted at the school throughout the day. Now Paul Farmer and his band of Klansmen had arrived with guns, prepared to intervene. Their presence was no idle threat; whites had murdered two black men in the mill town in the past two years, including a sheriff’s deputy. But Farmer had a problem. Standing in the street only a few feet from the Klan, was a line of grim, unyielding black men. They were members of the Deacons for Defense and Justice, a black self-defense organization that had already engaged the Klan in several shooting skirmishes. The two groups faced off: The Klansmen on one side and the Deacons on the other. Fyi, this pdf has Deacons for Defense combined with David Gilbert's Looking at the White Working Class Historically.